This fun ADA Steering Panel Play Structure puts kids in the driver’s seat. Anyone can start driving! This panel structure puts your ADA-needs kids behind the wheel. The dashboard features a moving steering wheel and stationary readouts for odometer and RPMs, gas tank, and turn signals. There’s plenty of room below the panel to fit a wheelchair, and you can simply set the height of the panel at your preferred distance from the ground (the 4 post clamps are adjustable). The outside posts are made from galvanized steel, and they measure 3.5″ outside diameter. They are secured in the ground with concrete. The rock singer and former Van Halen front man Sammy Hagar famously said that he just can’t drive 55. 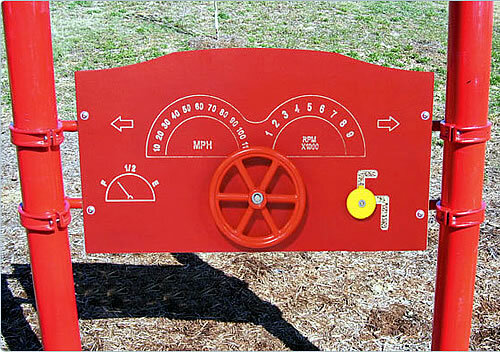 Your kids will know exactly how the “Red Rocker” feels when they get behind this fun steering wheel panel!